When looking for that perfect coach, the glitz and glamour of it may be important, but not nearly as important as what isn’t seen! ShowHauler builds each coach using a steel frame on the sidewalls, floor and ceiling! 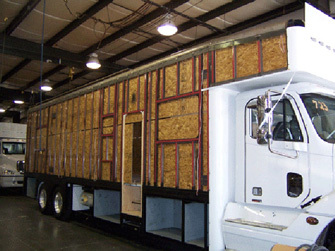 They use block foam insulation which is bonded to .063 aluminum exterior sheeting, keeping a clean exterior finish. The interior is set with a 7/16” structure board which is matted to the walls and ceiling, adding to the strength of the conversion cage. Fit your interior with home appliances, luxury leather seating, Corian® countertops, ceramic or hardwood flooring, and all custom built cabinets. It’s all up to you—stick with the standard features or upgrade to your heart’s content. However you design your coach, you can rest assure knowing that safety and convenience is our number one priority during the build process!